You can monitor the status of the official accounts of the Government of Serbia on the Ministry of Finance website. Ministry of Foreign Affairs has allowed for diplomatic – consular offices of the Republic of Serbia to open a special account for donations. A list of accounts which are published by the Embassies can be found here. Through accounts of diplomatic – consular office you can avoid the costs of transfer of individual payments. 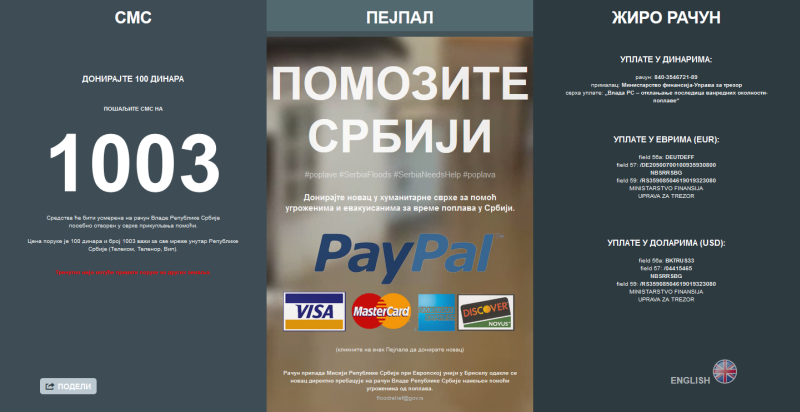 Every donation is forwarded to the account of the Government of the Republic of Serbia (Ministry of Finance), with details of the name of the donor and the amount paid. Data on the number of counts in specific countries can be downloaded from the websites of the embassies. Office for assistance and rehabilitation of flooded areas is established by the Regulation at the official government session on May 22. The office will coordinate reception and distribution of the entire humanitarian and other assistance addressed to the Government of Serbia for threatened by floods, to determine the criteria and procedures for the distribution of aid and coordinate the assessment and rehabilitation plan of any damage , it was announced at Government session. Earlier, Finance Minister Lazar Krstic, at the cabinet session which held on May 20, has announced that the Office for Humanitarian Aid will be established. Krstic explained that the floods carried out in coordination with the municipalities, through the revision of the budget as well as through other mechanisms. The Minister pointed out that the procedure is greatly simplified, so customs expenses on humanitarian aid is not charged because medicine and food need to arrive in time to those who need it. Earlier, Prime Minister Aleksandar Vucic said that there will be no misuse of humanitarian assistance. He appealed to people who lived abroad to contact competent institution when they send humanitarian aid because of preparation for taking over. 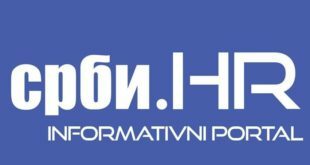 Action of collecting money was expanded on social networks so that more people abroad hear about catastrophe which happened in Serbia, which has massive proportion, repeated Krstic. Minister Mihajlovic stated that infrastructural flood damage exceeds 260 000 000 euros.